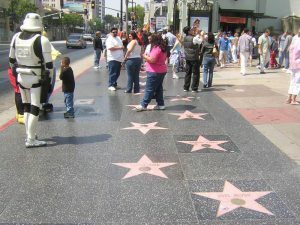 Event Description: An exciting place to participate in a corporate teambuilding event, Hollywood retains its historic sparkle, with movie theaters galore, high-end shopping and dining, and of course, the Walk of Fame. Location History: A sleepy town up until the turn of the 20th Century, Hollywood burst onto the international scene in 1910 when D.W. Griffith shot his 17-minute short film, In Old California, the first movie to be filmed in Hollywood. During the next decade, four major studios were to set up shot in the area: Paramount, Warner Brothers, RKO, and Columbia. Tinseltown –referring to the glittering nature of the movie industry –was born. During your corporate teambuilding treasure hunt… expect to encounter a variety of characters in costume; mammoth movie star murals 2 stories tall; stars and more stars; the famous hand prints at the Chinese Theater, and much, much more.